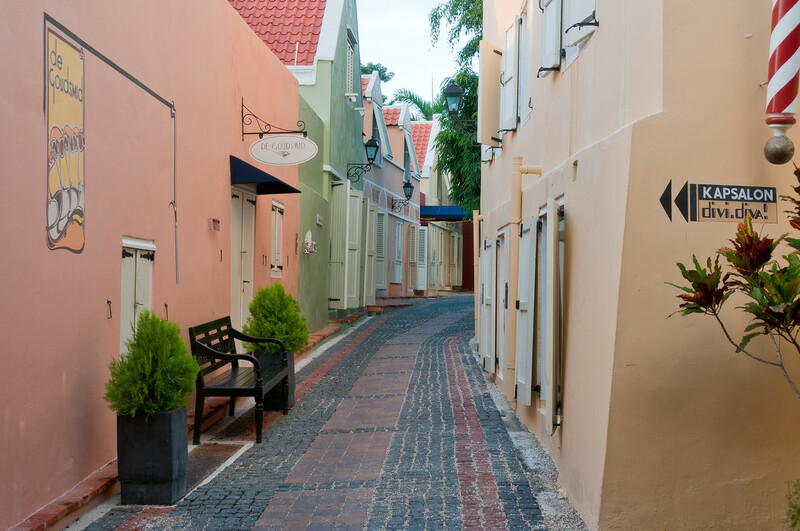 The modern town, the capital of the island nation of Curaçao, consists of several distinct historic districts, reflecting different eras of colonial town planning and development. Punda, the oldest part of the city, was built in the 17th century on the eastern side of Sint Anna Bay, adjacent to Fort Amsterdam and is the only part of the city that had a defense system consisting of walls and ramparts. The other three historic urban districts (Pietermaai, Otrobanda, and Scharloo) date from the 18th century. Water Fort and Rif Fort, also included in the inscribed property, were built in the late 1820s as part of a more extensive series of fortifications. In the midst of the historic area is a natural deep-water harbor. The entire property encompasses 86 ha and is surrounded by an 87 ha buffer zone. The architecture of Willemstad has been influenced not only by Dutch colonial concepts but also by the tropical climate and architectural styles from towns throughout the Caribbean region, with which the settlement engaged in trade. Early residences constructed in Punda followed Dutch urban design. In the 18th century, local materials and craftsmanship as well as new architectural elements, such as galleries, began to appear. As the city expanded beyond Punda, the architectural style of the residences evolved. For example, the development of Otrobanda was not restricted by ramparts and houses were built on spacious lots and resembled plantation houses surrounded by galleries. Moreover, the social and cultural differences from Afro-American, Iberian, and Caribbean inhabitants have contributed to enriching the building traditions as well as the city’s cultural life. The result is a European architectural style with regional adaptations in a rich array of Caribbean colors. 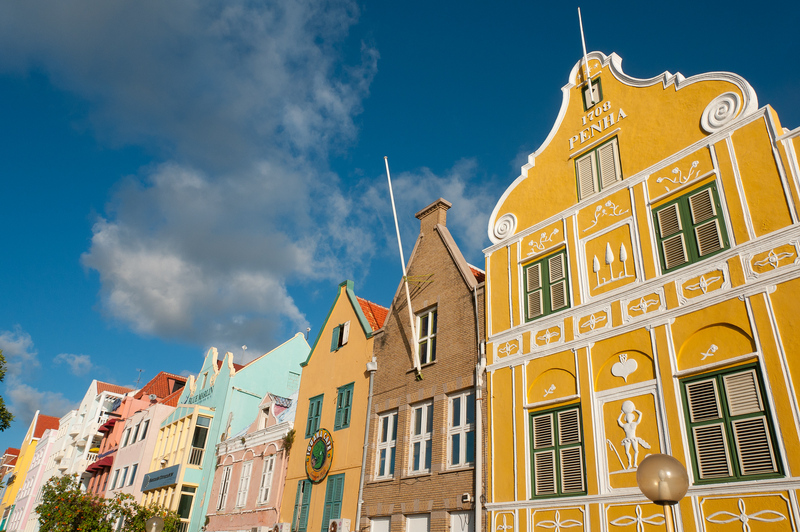 The colorful buildings of Willemstad are a local tradition dating from 1817 when the previous style of white lime finish on a building exterior was prohibited, apparently to protect eyesight from the glare. Predominant colors are red, blue, yellow ochre and various shades of green. Curacao is unique among the former Dutch colonies in the Caribbean. It has a very European flavor compared to nearby islands such as Aruba and Bonaire. Even today you will see more European tourists on Curacao and you will be more likely to find Dutch actively spoken than on the nearby islands. The Historic Area of Willemstad, Inner City, and Harbour is a UNESCO World Heritage Site in Curacao. Willemstad is also the capital city of Curacao. It is an island located on the southern portion of the Caribbean region, which is a constituent of The Netherlands. In fact, it was the former capital of the Netherland Antilles until the latter was dissolved in 2010. 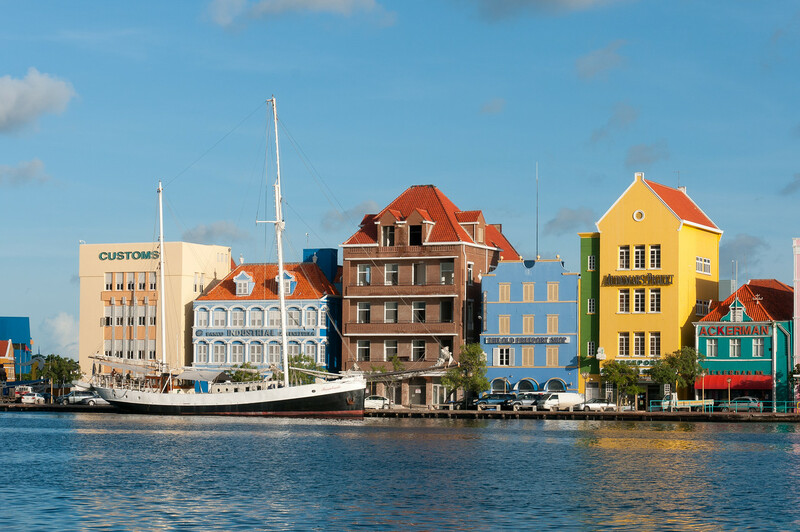 With an estimated population of 150,000, Willemstad is a historic center that is divided into four quarters. 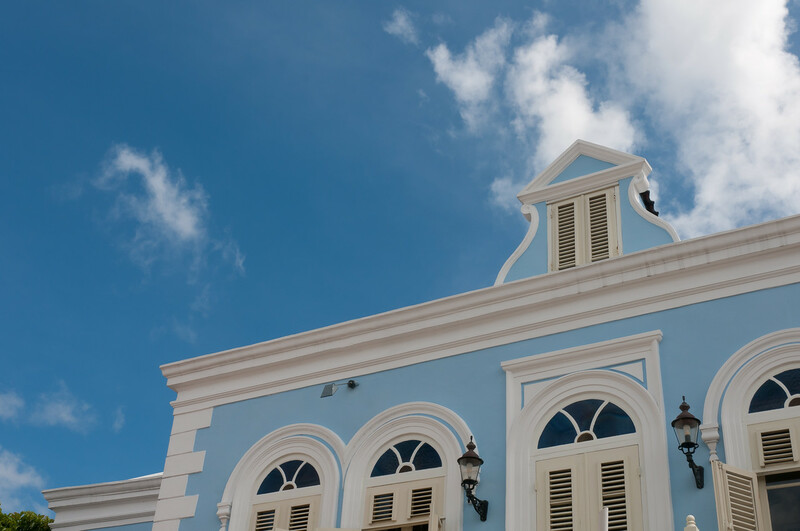 Willemstad is also where you will find the Curacao synagogue, which is the oldest one to still exist until today in America. The city center and historic area earned the nod from UNESCO as a cultural heritage site because of its unique architecture and harbor entry that played a historical role. It was inscribed into the list in 1997. The Historic Area of Willemstad, Inner City, and Harbour is a collection of properties that form a world heritage site in Curacao. According to UNESCO, this city (especially the historic area) is the best surviving example of European colonial history in the Caribbean region. The Dutch town planning and architectural traditions are still preserved until today. In fact, colonial influences are well mingled with the local traditions. The historic area of Willemstad was established by Colonial Netherlands. The colonizers used the natural harbours of Curacao to establish trading routes between Caribbean and the Americas. It was only a matter of town until the colonizers decided to establish a settlement in Willemstad. In fact, various communities were established during this time. Therefore, this historic city illustrates the organic growth of multi-cultural communities in 3 centuries. Prior to this, Willemstad is already considered historically significant as it morphs 4 distinctive quarters into one city: Punda, Pietermaai, Otrobanda, and Scharloo. Each of these districts is divided by the open waters of the natural harbor. In addition, each district has its own urban layout. The only thing that makes each of these districts similar is the tropicalized version of Dutch architectural styles. Even though it was in the 17th century when the Dutch established the Historic Area of Willemstad, Inner City and Harbour as a trading post, the original urban structure remains as it is today. Among the first few buildings that were constructed by the time of the initial Dutch invasion featured the traditional Dutch brick style. Eventually, it evolved into the Curacao Baroque architecture style wherein the curved gable is a distinctive element (for example, the famous Penha Building). The Historic Area of Willemstad, Inner City and Harbour has gone a long way since it was recognized as a UNESCO World Heritage Site in 1997. It also took a long way and several centuries in order to shape the cultural landscape that helped earn it that recognition. The historic core of Willemstad, however, suffered a major setback during the revolt of May 1969. Several parts of the city were destroyed and that included some of the key historic areas. Destruction took over the city as the revolting masses set the city on fire. In addition to the destruction that happened, some of the heritage sites were also left in neglect for the next two decades after the said revolt. Hence, a new ordinance was established in 1988 to restore and protect the historic areas that later merited it the UNESCO award. If you want to visit the Historic Area of Willemstad, Inner City, and Harbour, you can take a flight via the Hato International Airport in Curacao. It is located on the north side of the island and is a bit close to the city of Willemstad. This airport services the majority of the international and regional flights in Curacao. You can also travel to Willemstad via cruise. Most of the cruise ships that dock in Curacao arrive at either the Curacao Mega Pier and Curacao Cruise Terminal. View the complete list of UNESCO World Heritage Sites in The Netherlands. Wonderful colors! Definitely a great place to vacation! Love the colors!!! Dying to dive there! really lovely colors, Gary. Well framed and shot.